Neil Gaiman's Journal: This is fun. CBGBs lost its lease, but I'd got to read a story on the stage there - "How To Talk to Girls At Parties" - before it did. And a story filled with 70s music, at that. Darby is the 6-year-old red-haired girl in My Friends Tigger & Pooh. Darby is voiced by Chloë Moretz (US) and Kimberlea Berg (UK). Her catchphrases are "Time to slap my cap" and "Good sleuthin', everyone!" 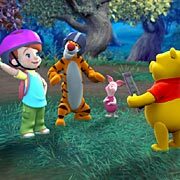 As revealed in the episode, "Christopher Froggin'," she is best friends with Christopher Robin.